Just days before the opening in Oslo of what’s billed as the largest exhibition ever of Edvard Munch’s art comes news that a majority of Oslo politicians finally have agreed on a site for a new Munch Museum. Their long-sought compromise ends years of quarreling that had become an international embarrassment. The high-rise museum design that won an architecture competition back in 2009 will be built after all, and at the site where it was initially intended: On Oslo’s redeveloped eastern waterfront at Bjørvika. Norwegian Broadcasting (NRK) reported the Munch Museum compromise as the city government parties led by the Conservatives (Høyre) called a sudden press conference Tuesday morning that included the opposition Socialist Left party (SV). NRK reported that SV has now gone along with the non-socialist government parties in supporting the Bjørvika site, in return for getting assurances from them that they’ll support community redevelopment projects in Oslo’s Tøyen district, where the current and long-inadequate Munch Museum is located. 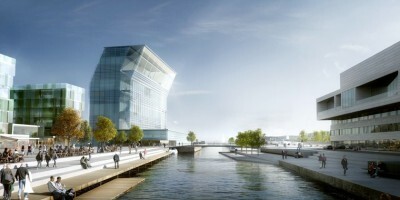 SV’s cooperation means the city government finally, after seemingly endless quarreling and efforts to block the Munch Museum project at Bjørvika by the most conservative Progress Party, now has the majority it needed to get the project underway on the waterfront next to the Opera House. She then presented the new redevelopment plans for Tøyen, which include a large “badeland” (aquatics park) and an open-air theater and concert stage. Complaints over the currently depressed state of the highly multi-cultural Tøyen district had hit a new peak in recent days, with neighbourhood protests and urgent calls for improvements. They’ve clearly been heard at City Hall, and ultimately led to the political settlement on a site and the design known as “Lambda” for a new Munch Museum. City politicians have become the targets of ridicule and even a torchlit protest march last autumn over their failure to build a new museum for Norway’s most famous artist, not least in the midst of this year’s celebrations of the 150th anniversary of his birth. Both SV and the Labour Party had argued to keep the Munch Museum at Tøyen as an anchor for redevelopment there. The Progress Party wanted to move the city’s priceless inherited collection of Munch art into what’s now the National Gallery downtown when it moves to a new site on the western waterfront. The Progress Party, with its former leader Carl I Hagen at the forefront, had argued that a new Munch Museum at Bjørvika was far too expensive and that it would be better to make use of the vacated National Gallery. Arguing is likely to continue as development gets underway, but the settlement on the site is a breakthrough. Museum officials were heaving a sigh of relief as they geared up to open the new Munch exhibit this weekend at both the National Gallery and Tøyen, and finally feeling they can celebrate a bit themselves.